You make an interesting point. We look back at parts of history and are shocked certain events occurred. We shake our heads at the ways people were treated and the challenges they had to overcome. Yet these very things happen across our globe today and we hardly stop to notice. What great discussions you and your students are having! Your post made me think of how I grew up in a rural setting. It was so dark I could see the stars so clearly at night. As an adult, I like in the suburbs with street lights. The stars aren’t nearly as bright. I am interested that there is not much interest in what is happening in North Korea. You might be right. They hear it a lot, but it really isn’t real until they have a personal connection. I like that you connected to the experience with the book. We have a great capacity to be able to ignore things until they affect us. Keep up the discussions. Something is bound to go in. What a telling visual. Interesting place to be if there are no personal connections it could just as easily be in Africa. Interesting post and picture, especially about the lights. My 7th grade classes read The Diary of Anne Frank, Reader’s Theatre version, and loved it. I remember their confused faces when talking about the privileges taken away from the Jewish people. “How could they let that happen” was their big question. Where there is no freedom of speech, much goes unnoticed. I enjoyed your slice very much. Sorry I haven’t read your blog before. I will now. Glad that you will stop by blog. My students have continued to have many confused faces as we’ve been reading the book and they are trying to make understanding of what was happening to the people and Jews in Denmark. What great connections your kids are making as you read Number the Stars. Awareness is needed before action. Maybe one of them will grow up to be the one to make a difference in the North Korea conflict. I totally agree that awareness is needed first. I think I will write some more posts on N.Korea and my perspective of things as a Korean-American here in Seoul. What an effective picture to go with your slice. It is so hard to really understand what life may be like for the person next to you, much less a fellow human in another place or time. I am so glad the book is helping your students make those connections. I think it is one of the most important things we teach. Your slice made me sad for our students, who don’t have the maturity yet to grasp the injustices around them and do something about them. Some day, for your students and mine. This is so powerful, thank you for calling it to our attention. I was not aware of such vast differences. Thinking about description of your historical fiction study, I wonder what other things – so many, I’m sure, both good and bad – that we are unaware of in today’s world. History does have a way of repeating itself. Thank you for a thought-provoking slice. I think that you’re thinking along the right lines when you think about the suffering of the people in North Korea. The question really is how do we respond to this humanitarian crisis? I would love to find the answers to that. There are various ways to help the people of North Korea. Many different NGOs that are involved in helping them. I will try to post more about ways to help and bring awareness to N.Korea. Thanks for your question. Also, I don’t have an iphone…I have an android smart phone! Very powerful and sad post. I wonder how often I am unaware of how my neighbor’s are hurting, too. At the same time, to see a whole country suffering in your backyard must be really disturbing. It is really difficult because it does seem that in general the people of South Korea don’t have as much of a concern for the suffering and crisis in North Korea. Of course there are some people, organization and churches that are passionate about bringing awareness and supporting reunificiation here in Korea as well. As others have said here, you are opening your students’ eyes through books like Number Their Stars. 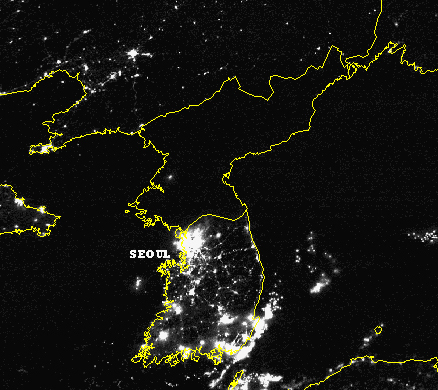 That picture of the two Koreas at night is so haunting. A great book to make students aware of how we can learn from history. I’m enjoying your slices!